Pictured are the results of two simulations. 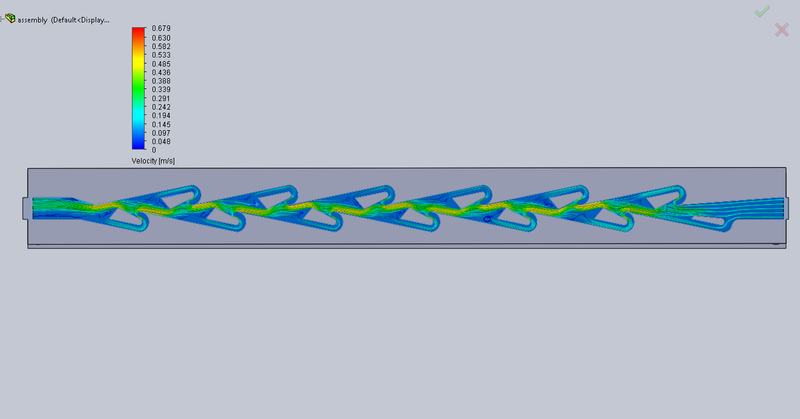 The first simulation is the conduit in a configuration with the fluid flowing “against” the choke, opposite the direction of intended flow. 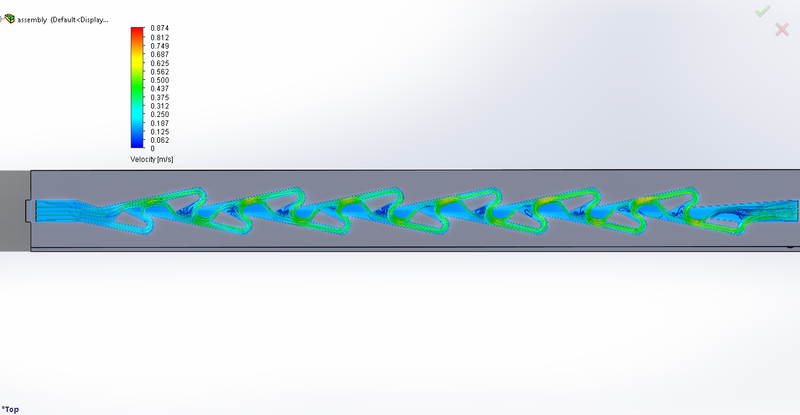 The second simulation is of the conduit in a configuration with the fluid flowing “with” the choke, in the direction of intended flow. These two simulations together show that the Reynolds number is approximately double in the “against” configuration when compared to the “with” configuration. This suggestions that, if placed inside of a pulse jet engine’s intake, the total length of the engine’s intake could be reduced to a size that is practical for flight. Largely forgotten, the “Valvular Conduit” was created by Nikola Tesla as single part in a system that was designed to leverage different viscosity fluids to generate mechanical motion. With no moving parts and a unique geometry, it is considered one of the most efficient and aerodynamic valves ever conceived. This device dates from before Tesla began experimenting with electricity and pioneering the alternating current system that powers every electrical grid in the world. Most jet engines are of the turbine variety. A system of turbine blades compresses an air-fuel mixtures, which is then ignited, and the ignited gases expand outward through the system – providing thrust and powering the turbine blades that perpetuate the system. A jet-turbine engine has a large number of moving parts, that all must be manufactured to extremely exacting dimensions. Pulsejet engines have almost no moving parts – if any at all. The natural operation of the engine creates a oscillating wave of hot gasses, that naturally compresses and ignites the air-fuel mixture. The downside is that they require a relatively large design for the amount of thrust they generate. If the engine is laid out linearly, the intake must be long enough to contain the expanding gases, while short enough to still allow fresh air to reach the reaction point during each cycle – and such a design almost always needs to have a high enough airflow through and around the system to operate at all. If the takes on a u-bend design with its intake, the engine loses the ramming-force that would come from normal operation while in-flight – without which, the engine is less efficient over all. The valvular conduit seemed ideally suited to allowing for a linear pulsejet engine, without requiring a prohibitively long intake or to have airflow continuously rammed down the intake. The shape of the conduit allows for a very direct path and low resistance to airflow in one direction, and a very long path and high resistance to airflow in the other. By replicating a design very similar to Tesla’s valvular conduit, and using it as the system intake, we believe that fresh air and fuel can be easily introduced into the system, and hot gases prevented from back-firing through the intake. As long as the material can withstand the forces of the working fluid and its velocity, this valve can function at whatever frequency the engine requires of it, making ideal for high-frequency applications like pulse jet engines where a traditional mechanical valve cannot operate quickly enough to choke flow in a certain direction. The specific design of the conduit itself could use with some optimization, to maximize the number of flow lines entering into the side chokes, and minimize their impacts on the side walls of the conduit itself.